Stuff Points: Earn 100 points when you buy this stuff. This Monkey Bar is not for kids at the playground. It is a serious storage solution for all of your outdoor tools and garage clutter. Unlike other storage racks out there, this one can handle tons of abuse without flinching, and it is designed, and warranted, to last a lifetime. Thick, industrial steel construction makes it strong enough to hold tons of tools and other heavy objects, and durable enough to look good and work perfectly for many years to come. 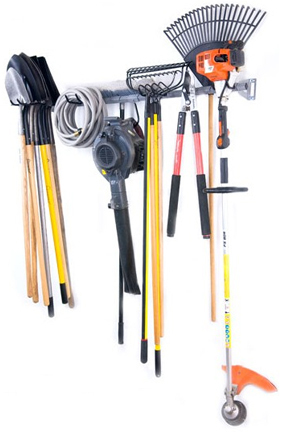 Stack, hang and pile up to 200 pounds of shovels, rakes, weed whackers, hoses, sledge hammers and more in order to eliminate messes and keep your garage, shed or utility trailer organized. The Large Garden Tool Rack by Monkey Bar Storage is versatile enough to handle numerous shapes and sizes of tools at once, and it will do so without making them hard to manage. Instead of that jumbled pile on the floor, or in the corner that you are dealing with now, you will have a neatly organized area to hang and sort your tools. This will not only make your life easier by providing a simple solution for easy tool retrieval, but it will also increase the longevity of your precious tools by preventing scratching, smashing and other random breakage. This is the large size, but we also carry the smaller 35" tool rack too. Both units offer the same quality materials, so the only difference is length of the bar and number of hooks that are included. This Large Garden Tool Storage Rack is the ultimate in versatility. The extra wide bar gives you plenty of room to work with, but that is just the beginning. It comes with a multitude of hooks in differing shapes and sizes so that any type of tool can be accommodated. Some are single hooks and some are double. There are long ones and short ones, and many variations as far as width between each hook. You can prop, dangle, support or place just about any tool up there and have it be held securely. Some will hang by handles, while other things like shovels will be supported by the head as the long pole hangs below. Cords and hoses can be held in an orderly fashion so that they stay raveled for the next use, and every tool or other item will remain easy to see, and quick to grab. Just about any yard tool and all kinds of other stuff can be placed on this storage rack to help keep your garage or shed clean. Each hook can be secured at any point along the length of the bar, and you can have them facing forward or backward. This feature will allow you to set up the type of organization that works best for your tastes, as well as your particular types of tools. Since you can hang things in front, or behind the bar, you can easily place your most used tools front and center, while keeping your less used tools on the back side. They will still be neatly arranged, but they will also be out of the way since you hardy ever use them. This storage rack is wide enough to hold a number of tools without seeming cluttered, and it sits far enough away from the wall to accommodate large or odd shaped things like leaf rakes and wheelbarrows easily. This is a complete storage system for use with any of your outdoor tools, and it comes with everything you need for a full install. With this large garden tool storage rack set, you get one 51" Monkey Bar with the mounting brackets and hardware. You also get two 3" double hooks, one 3" single hook, one wide 3" double hook, two wide 5" double hooks, one "J" hook and one 12" double hook. The package is completed with the inclusion of easy to follow instructions that detail the quick and simple install. All of the parts are heavy-duty and commercial grade, so once you hang this tool rack, you can be sure that you will have a strong and efficient way to store your tools that will last a lifetime. The hooks are all made from industrial strength steel, just like the bar and mounting brackets are, so you will never have to worry about being gentle with this rack. The "J" Hook is an easy, go-to hook for quickly throwing things on the rack. It works perfectly to hang leaf blowers or electric weed whackers by the handle, but you can also use it to hang work gloves, hoses, cords and more. The long, 12" double hook is the perfect hook to hang and organize all of your rakes and shovels. Most of us have a couple kinds of shovels and at least two rakes. All four of those and more can be held using just the 12" hook, and they will remain neatly lined up, one behind the other until you need them. Use the 3" single hook to hold up hedge clippers and other pruning equipment. The fatter rear end of a weed whacker is easily supported by one of the wide double hooks, and these types of hooks are also perfect for hanging cords and hoses, or sledge hammers and other large tools. The possibilities really are endless, and thanks to the wide assortment of hooks, you should be fully prepared to prop up any tool you have. Installing the Monkey Bar Large Garden Tool Storage Rack is pretty simple. If you can drive in screws, you have the technical ability necessary to complete the job. Exposed studs make the work easier, and many garages, sheds and trailers have unfinished interiors so you may be in luck. You can also install in cement, brick or cinder block, but you would never want to just hang it from sheet rock without hitting a stud. Step one is to find studs or another secure location to place the rack. The size of the bar is such that it perfectly spans between two studs to make your job easier. 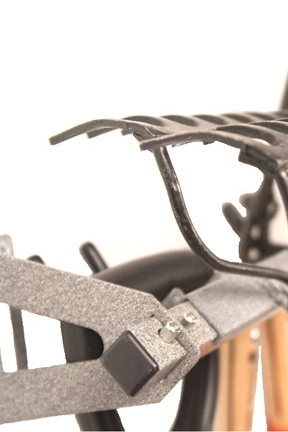 The mounting brackets can be used in either direction, so flip them one way or the other in order to help line them up perfectly, or fit the rack into a tight space. The whole installation should only take 10-15 minutes from start to finish, and it only requires you to drive in four screws. For a perfect install you will want to use a level to ensure the bar is straight, and you will want to drill pilot holes before you set your screws. Once the brackets are on the wall, simply insert one end of the monkey bar into the hole on one of the brackets, and then press down the button to stick the other end in the opposite bracket. Once you depress the button, the bar will be secure and immovable, so all you need to do is hang up the hooks in order to finish the install. They can face front or back, and they can be in any spot along the whole length of the bar. Once you have the hooks in place, you are ready to take the clutter off the floor, and quickly hang to get organized. You could spend less money on a cheaper solution, but it will never have the durability and versatility that this industrial strength storage rack offers. Due to the clever design and high quality materials, it is not only stronger than the competition, it is also able to hold 2-3 times more stuff than other, similar sized storage units. Because you will be using this to store heavy tools and other bulky, outdoor equipment, you really want something that is up to the task. This heavy duty storage rack will last longer than the tools it is meant to hold up, and you will never have to replace it like you might with less sturdy options. 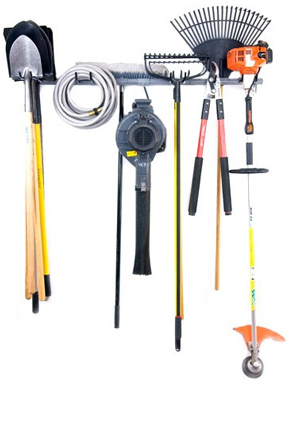 Get the Large Garden Tool Rack from Monkey Bar Storage and you will have a strong and simple solution to help you clean your garage, and organize your tools. You will be able to eliminate that pile of messy tools, and free up valuable floor space. It will bring some order to your garage, shed or basement, and will help your tools last longer, while making them easier to find in the mean time. You will prevent damage and make room for even more tools by organizing and storing the ones you have now with this rack. Order Yours Today! 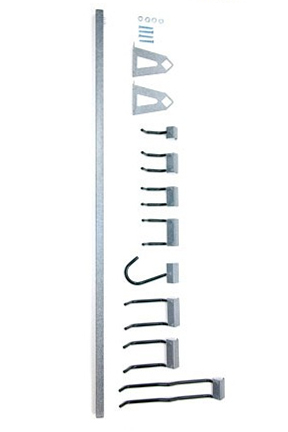 Dimensions 51" x 18" x 4"
Parts Included 2 brackets, 4 screws and washers, one 51" Monkey Bar, two 3" double hooks, one 3" single hook, one 3" wide double hook, two 5" wide double hooks, one "J" hook, one 12" double hook and installation instructions. Large Garden Tool Storage Rack - An extra wide, tool organization system from Monkey Bar Storage. Get the clutter off the ground and hang it neatly with this versatile rack. It can be used for virtually any type of yard tool you have, and it installs in under 15 minutes. Order Yours Today! Storage Rack is easy to install; high quality; sturdy, provides multiple hooks for hanging tools and flexible system to customize how you want to hang the tools. very satisfied with purchase. How would you connect it to a steel frame barn? The included hardware is designed for a flush mount to material that can take a screw, but any number of modifications can be made with additional hardware to accommodate other materials and locations.